It is gathered through a states in the North-east sub-region have intensified efforts to encourage enrolment of pupils into primary schools following the return of peace to the area. A survey by the News Agency of Nigeria indicates that the states have evolved programmes to encourage enrolment in schools, in addition to the Home-Grown School Feeding Programme of the Federal Government. Stakeholders in the area say the free feeding programme is playing key role in attracting pupils to remain in school. Shettima Kullima, Chairman of Borno State Universal Basic Education Board (SUBEB) said they had registered 247, 877 pupils in public schools for the 2018 academic year. He told NAN that the figure comprised of 142,589 boys and 132, 288 girls enrolled in 623 primary schools spread across the state. He explained as a result of the insurgency experienced in the state about 1, 346 schools needed to be rehabilitated and equipped with class room furniture as well as instructional materials, to provide enabling environment for learning. Mr. Kullima said that the improved security situation had encouraged enrolment and retention in schools across the state. On school feeding programme, the chairman said the board had concluded arrangement for the commencement of the exercise in designated schools. Also commenting, Bulama Abiso, the Borno State Chairman, Nigerian Union of Teachers (NUT), said the union had initiated a feeding programme targeting 1,000 displaced pupils to encourage them remain in school. He said that the union was spending about N1 million monthly on the feeding exercise in some selected schools in the state capital. In Gombe, the state government said it had begun preparations for the implementation of the Home-Grown School Feeding programme across the state. “We have passed various stages of preparation and as soon as we conclude, we will start, probably before the year runs out,” said Maryam Mele, Special Adviser to Governor Ibrahim Dankwambo on Social Investment. She expressed optimism that the programme would boost enrolment of pupils in primary schools, as well as improve the nutritional status of the children. Also speaking to NAN, Zulaihatu Madugu, Director School Services, SUBEB, said there were 1, 378 pre-primary and primary schools in the state. She said the number of Kindergarten enrolment was 5,186 across the state, made up of 2,693 males and 2,493 females, while enrolment in primary schools stood at 625, 904, out of which 432,567 were males and 193,337 females. 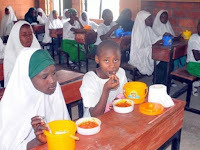 Yahaya Yero, Executive Chairman of Bauchi State Universal Education Board (SUBEB) said the Home-Grown School Feeding Programme of the Federal Government had increased enrolment of pupils in the state. He said that the programme had also assisted in retention of pupils and wiped out absenteeism in schools, “as confirmed to him by Education Secretaries from various Local Government Councils. “They said that lots of new faces that were previously enrolled but hardly attended classes have become regular pupils. The SUBEB chairman added that the board had 4,364 schools, with total pupils enrolment figure of 1,079,105, while number of teachers stood at 25, 827. Mansur Manusoro, Special Assistant to the state governor on Non-Governmental Organisations (NGOs) and Social Investment Programmes, said N1.5 billion had been spent on the implementation of the Home-Grown Schools Feeding Programme in the state. According to him, the programme is in its third phase in the state. “‎Over 2,000 schools across the state are benefitting from the programme, involving 5,005 cooks feeding 501, 399 children,” he said. Meanwhile, Jigawa Government has commenced the implementation of the school feeding programme on January 31, 2018. The Deputy Governor of the state, Ibrahim Hassan, said at the flag-off of the Home-Grown School Feeding Programme that it would enhance attendance and retention of pupils in primary schools. Investigation by NAN reveals that there are about 600,000 males to about 250,000 females in primary schools in the state. In Yobe, the Executive chairman of SUBEB, Goni Ibrahim, said there were 1,160 nursery and primary schools in the state, as well as 116 Junior Secondary schools. He however said the board, in collaboration with UNICEF, has engaged in massive sensitization to boost enrolment in primary schools. According to the chairman, the state is not captured in the current school feeding programme of the federal government, but expressed optimism that the state would be involved in the next phase. In Adamawa, Julius Kadala, Commissioner for Education said the state had a total primary school enrolment figure of 596, 000 pupils in 1,941 primary schools across the state with 24,000 registered teachers. He disclosed that the school feeding programme had not commenced in the state.